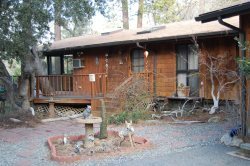 This Beautiful home is located in the quiet area of Pine Cove just minutes from Downtown Idyllwild. When you enter there is an open floor plan with the Kitchen, dining area and Livingroom where you can relax listening to the Bose stereo system, watch some TV or surf the web. Upstairs there is a bedroom with a queen bed and its own full bathroom and downstairs you will find the Master bedroom with a king bed and full bathroom. Relax in the sun outside on the deck or sit in the shade on the covered porch, where ever you choose you will be surrounded by the beauty that our mountain offers. Bring your Mountain Bike and just walk up the street and hit the trails as this home is just a few feet from the national forest and one of the best biking trails around. After a long day on the trails come home and soak in the Jacuzzi where you can unwind and loosen up then have a seat in front of the fire and watch a movie. This home is fully furnished and ready for your weekend.